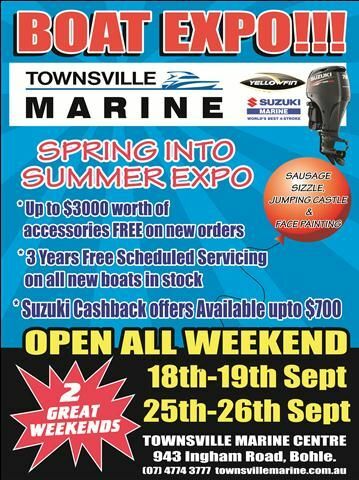 Townsville Marine is having it's very own 9 day Expo starting this weekend! There's jumping castles and face painting for the kids - yummy cool slushies and sausage sizzles ! And, of course, there are loads of new Quintrex and Yellowfin Boats on display - powered by Suzuki, the World's Best 4 Stroke! Knighty will be there sharing his knowledge on how to catch fish, tie knots, tides and everything else on how to catch the big one that didn't get away!! Cashbacks - get 'em while they're hot! 3 years free scheduled servicing on all new boats in stock or up to $3,000 in options free! With over 80 Quintrex and Yellowfin plate boats in stock ready to tow away, you'll be amazed at the deals you'll get at the Expo. One thing you don't have to worry about is scheduled servicing for three (3) years! That's right, buy any boat in stock at the Expo and you'll get 3 years scheduled servicing free! If the boat you are looking for isn't in stock - you can add up to $3,000 worth of factory fitted options at no charge (it's a sliding scale, but if you buy a boat for $10,000 and we don't have it in stock, you'll get $500 worth of options added at no charge - more details at the Expo). Tell your friends it starts this weekend - and goes for 9 days (jumping castles etc on weekends only).